Englishman Paul Casey will take a three-shot lead into the final round of the AT&T Pebble Beach Pro-Am. 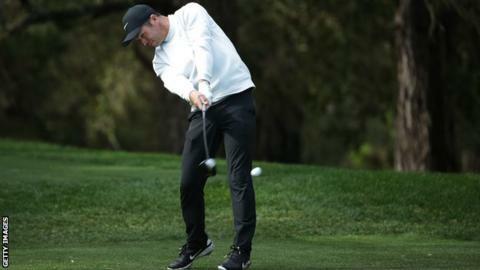 The 41-year-old world number 24, who has two PGA titles, began the day tied for the lead and carded a five-under 67 at Spyglass Hill to reach 15 under. Four-time winner Phil Mickelson had a mixed 70 at Pebble Beach and has sole possession of second place. Scot Russell Knox is six back after a 68, with Northern Ireland’s Graeme McDowell a further two strokes adrift. Three-time major winner Jordan Spieth, who had to complete two holes early in the morning at Spyglass Hill following Friday’s suspension of play because of bad weather, is alongside McDowell at seven under after two double bogeys in his two-over 74. Mickelson, 48, made his 500th cut on the PGA Tour and recorded a magnificent eagle on the 14th after a four-iron from 239 yards to three feet, but had three bogeys in his opening nine holes. Competitors play a round each at Pebble Beach, Monterey’s Shore course and Spyglass Hill over the first three days. Sunday’s final round for the top 60 and ties is played exclusively at the legendary Pebble Beach lay-out.